Topics: What We Do, and Who We Are. 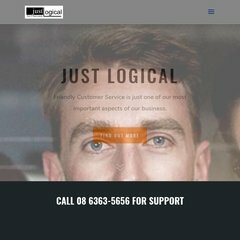 justlogical.com.au Contact Us - IT Support Perth | IT Solutions, IT Service and ..
Its 2 nameservers are ns2.westnethosting.com.au, and ns1.westnethosting.com.au. Iinet Limited (Western Australia, Perth) is the location of the Apache/2 server. It is written for PHP/5.2.9 language. The server is slower than 73% of measured websites, at 2492 milliseconds.